Leave it to a Japanese lube maker to keep Captain Kirk's seat free of rust. Oh my. 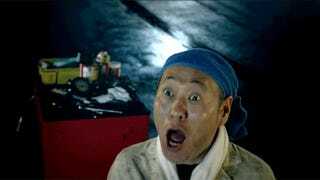 As noted on MSN and NariNari.com, a commercial for Kure 5-56 features scenes from Star Trek Into Darkness, which opened in Japan about a month ago, mixed in with footage of celeb Shigeru Izumiya as a Japanese Mister Spock, wielding a can of rust-preventing lubrication. In the ad, Scotty says the ship is going to rust, but Izumiya says the 5-56 spray will prevent that from happening. 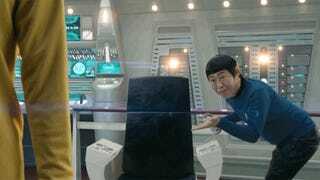 The next shot shows Japanese Spock telling the Captain to sit down. It kind of looks like he sprayed it on the Command Chair, instead of the chair's swively bit. The Star Trek spot isn't the only Hollywood tie-up for Kure 5-56. There's also a Transformers commercial in which the spray turns a rusty car into Bumblebee. This is the takeaway. Never forget.